A room with a sloped ceiling may seem a little impractical and difficult to decorate at first, especially when you consider the reduced head height along the edges of the room, but we suggest you work with the drama and impact of this architectural feature and create a space that plays off the strong angles and proportions of the room. Paint the area in neutral or light colours to create the sense of more space. To accentuate the room design and slope of the ceiling use tones of the same shade rather than too bold a colour. Use the periphery of the room to install practical customised storage units to keep the space looking neat and tidy. Choose furniture that is proportionally suited to the space i.e. low back couches. 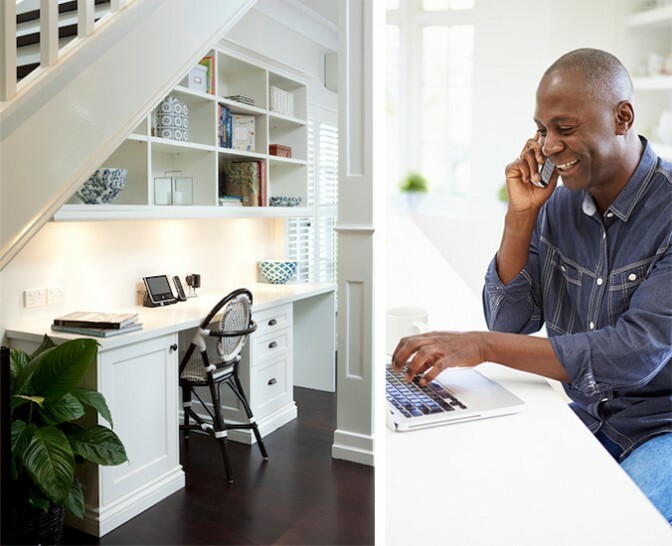 Do not compromise on the lighting, make sure that all areas are well lit. Use a mix of hanging pendants and down lights to ensure there are no dark corners. Add skylights and windows to allow in as much natural light as possible and choose practical and stylish window finishes such as shutters. Shutters complement the openings and can be designed to their unique shape and size. 1. Positioning a bathtub or bed under the lower part of a sloped ceiling is practical because of the reduced head height requirement. These shutters have been custom designed to fit the angled windows perfectly. If there is very limited space, simply create an accent wall with wallpaper, paint or artwork. If the space allows, create a decorative display on a suitably sized console table or smaller piece of furniture such as a kist. 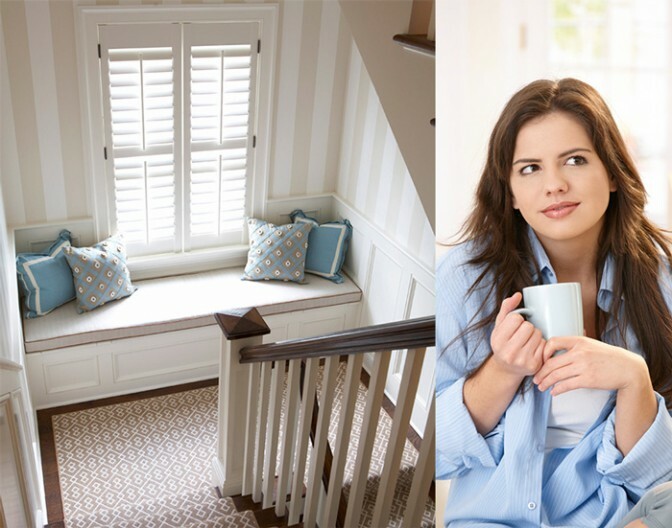 If you are fortunate enough to have a window on the landing, create a window seat with beautiful throws and cushions and decorate the windows with shutters from AMERICAN shutters as the louvres can be tilted to provide alluring ambience. 2. The natural sunlight filtered through shutters’ louvres adds interest and appeal to this sunny window seat. Very often a room has a corner that cannot be successfully integrated into the main area of the room, and seems to have no practical purpose. Perhaps it’s the position of the windows, doors or the space provided that poses a problem in creating a traditional space. Think out of the box and consider creating a space with a unique purpose all of its own. The solution may be to simply position a large piece of standing artwork, a potted plant or lamp in the corner, or create a mini-escape by adding a single comfortable chair for lazy quiet moments to be shared with a cup of coffee and a book. 3. Custom-made shutters with rebated stiles allow maximum privacy when closed and, when open make the most of a beautiful view. 4. Home office meets storage under the stairs. Separate the area by clearly identifying the space for traffic in and out the room, and the living space. Do this by positioning the furniture away from the walls, allowing space along the periphery of the room for people to walk. Use an area rug to demarcate the area to be used for seating. Paint the walls and the doors a similar shade so the focus is not placed on the openings but rather on the centre of the room. Use a neutral or light shade of colour to open up the space. Create a focal point in the space such as an accent wall, a fireplace, large piece of artwork or television screen. Use symmetry when positioning furniture to further indicate the living area of the space. Use the same finishing on all openings if possible to create a harmonious look that integrates the doors and windows seamlessly. 5. 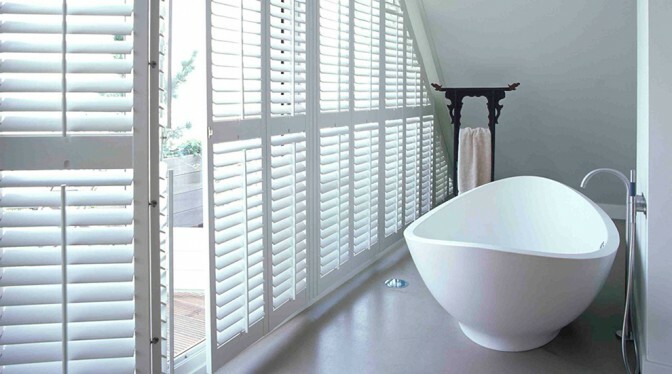 Bespoke shutters from AMERICAN shutters are ideal in a room with multiple doors and windows, as they complement rather than compete with other finishes in the space.